The New York City Council has put forth a series of bills that include various proposals. Some of the proposals are worthwhile, but others could make Uber more expensive and less reliable throughout the 5 boroughs—severely impacting New Yorkers who rely on Uber when public transit isn’t an option. If the City Council passes these measures, riders could have to pay substantially higher prices, wait times will likely increase throughout the city, and getting an Uber trip outside of Manhattan may become much more difficult. Tell the City Council what their proposed changes would mean for you and other New Yorkers. What specifically is the City Council proposing? The City Council is proposing five pieces of legislation to further regulate the for-hire-vehicle industry in New York City. New York City is already one of the most regulated cities where Uber operates throughout the world, with extensive requirements for companies, drivers, and vehicles. We do not oppose most of the Council’s proposed legislation. In fact, we agree with the Council that TLC-licensed drivers in New York City should earn a living wage, and we support their efforts to help make this a reality. The Council seeks to impose further regulations on companies like Uber that don’t apply to smaller companies and livery car services; we do not oppose many of these either. Additionally, the Council wants to reduce fees owed to the City to operate Wheelchair Accessible Vehicles (WAVs); this proposal would help the industry as we aim to successfully complete 90% of requests for WAVs while substantially lowering average wait times, a set of goals we agreed to meet earlier this year. 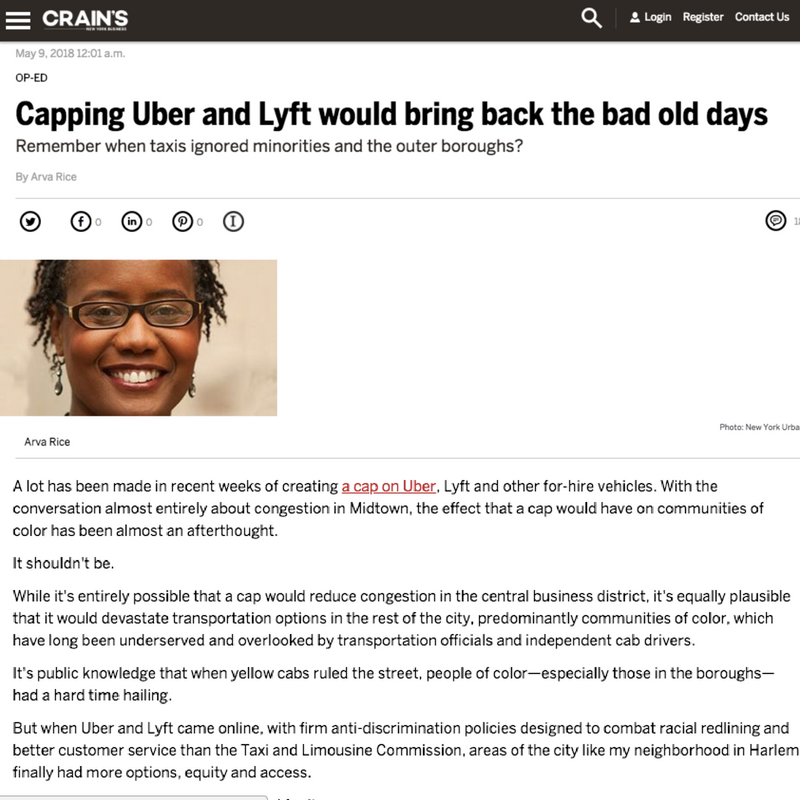 Wait, if Uber supports all of that, what’s wrong with the proposed bills? What’s most problematic is that the City Council wants to cap the number of for-hire vehicles for at least 12 months and give the TLC the ability to continue a cap beyond that. 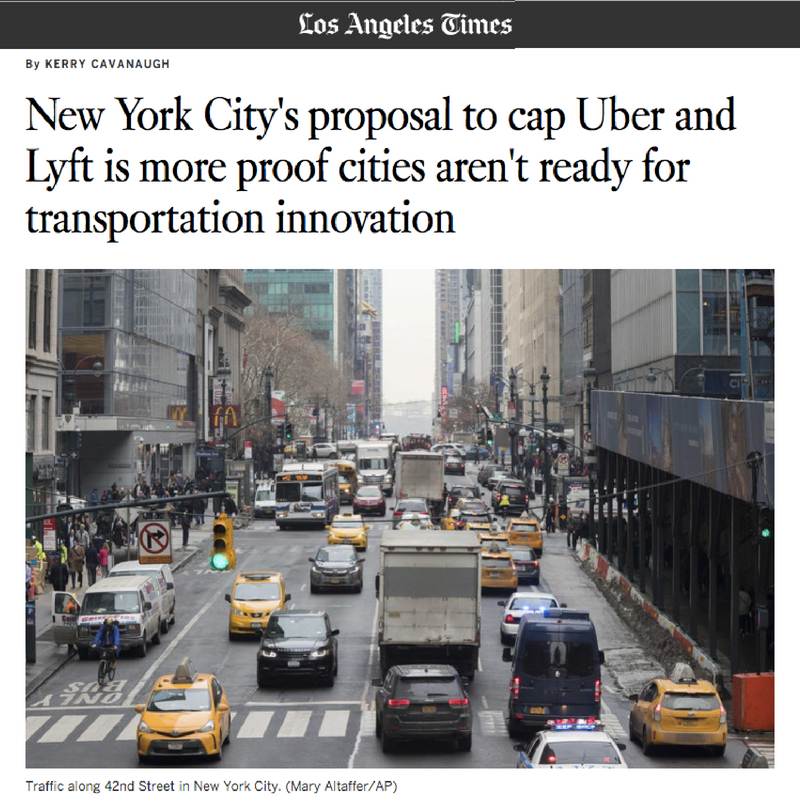 A cap will not reduce street congestion and is likely to result in increased wait times, higher prices, and significantly reduced reliability outside of Manhattan. Today, more than half of all Uber trips in New York City start outside of Manhattan. In fact, the majority of Uber’s growth is coming from the outer boroughs, particularly in neighborhoods historically ignored by yellow cabs and where access to public transit is limited. 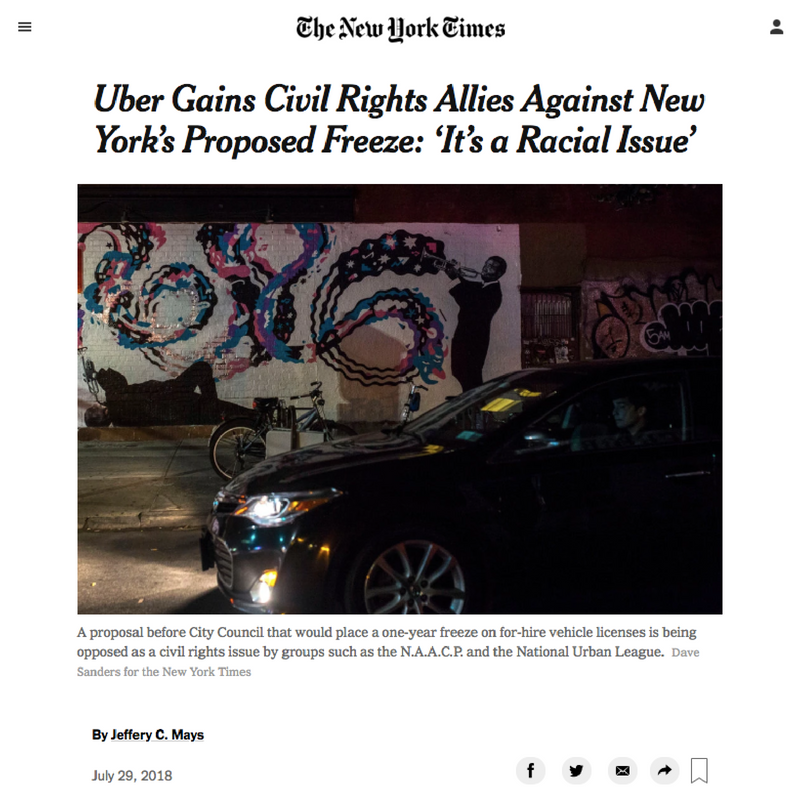 However, the Council’s proposed cap on companies like Uber could lead to less service for the millions of New Yorkers who live in the Bronx, Brooklyn, Queens, or Staten Island. The taxi medallion system is a real-world example of a cap not working: yellow taxis are able to pick up riders all across the five boroughs, but 92% of their pickups start in Manhattan. When an artificial supply cap is put in place (i.e., demand continues to grow while supply cannot), drivers gravitate to the most densely populated areas in order to maximize their earnings and find the most profitable fares. A cap on for-hire vehicles is likely to have similar consequences. Without being able to add cars to service the entire city, much of the progress we’ve made in bringing reliable transportation access to the outer boroughs could disappear. Implementing an artificial cap as demand continues to grow will simply create another de facto medallion system, which we know doesn’t work. Demand for rides has grown every year since Uber entered New York City, and with a transit system in crisis, this trend is likely to continue. More riders looking for rides with fewer drivers able to fulfill those requests is a recipe for higher prices and increased wait times. Another troubling provision that’s included in these five legislative proposals allows the TLC to set prices for rides requested through apps like Uber, regardless of what drivers are paid. While we support the Council’s efforts to make sure drivers earn a living wage, we do not support efforts that could potentially lead to higher prices for entirely unrelated reasons (e.g., tying what you pay for your Uber trip to what a taxi might charge). In addition to the serious concerns outlined above, it’s worth highlighting two interesting concepts in these bills that deserve more discussion: The legislation calls for efficiency standards and authorizes a TLC payment formula based on driver utilization. Both of these proposals, if implemented effectively, could lead to a demand-based solution, ensuring that only the right number of vehicles are on the road—all the more reason to focus on viable options instead of a cap. Where can I review Council’s proposals in more detail? Glad you asked! You can review the Council’s proposed regulations below. Int 0958-2018 A Local Law to amend the administrative code of the city of New York, in relation to reducing penalties for unauthorized street hails by licensed for-hire vehicle drivers. Int 0890-2018 A Local Law to amend the administrative code of the city of New York, in relation to establishing minimum payments to for-hire vehicle drivers and authorizing the establishment of minimum rates of fare. Int 0838-2018 A Local Law to amend the administrative code of the city of New York, in relation to the licensing and regulation of high-volume for-hire transportation services. Int 0634-2018 A Local Law to amend the administrative code of the city of New York, in relation to the waiver of licensing fees for accessible taxi-cabs and for-hire vehicles. Int 0144-2018 A Local Law to amend the administrative code of the city of New York, in relation to conducting a study of the impact vehicles for hire have on the city of New York, and authorizing the commission to establish and revise vehicle utilization standards for high-volume for-hire services and to regulate the issuance of new licenses to for-hire vehicles. So, how do we address street congestion? Like many economists and transit advocates, Uber supports comprehensive congestion pricing. It’s a serious plan to both tackle congestion and help fix our subways. An effective way to address street congestion in Manhattan is to implement congestion pricing for all vehicle types (delivery trucks, personal vehicles, taxis, for-hire vehicles using Uber, and other for-hire vehicles) and dedicate the funds generated to fixing the subway system. That’s why Uber has publicly committed at least $1 million to support the passage of comprehensive congestion pricing for New York City. What’s missing from the Council’s proposals? As part of this package, the Council has not put forward any relief for struggling independent owner/operators of taxi medallions. Uber supports the creation of a fund, financed by a surcharge on all for-hire vehicle trips, to help those owner/operators get out from under substantial debt. We believe that such support should be focused on individual taxi owner/operators, not medallion investors or speculators. Most importantly, the Council has yet to even propose a resolution calling on the State to pass comprehensive congestion pricing, which could fully fund our subways and alleviate congestion. We encourage you to review all of the Council’s pending proposals here.